Equilar and NASDAQ’s Compensation Committee Forum at the NASDAQ MarketSite October 27, 2015 New York, NY The Future of Long-Term Incentives: Key Considerations for Valuation, Equity Plan Reserves, and Holding Requirements A host of internal and external factors influence long-term incentive design. Having a portfolio of LTI vehicles can help boards accomplish multiple objectives. This panel will evaluate emerging LTI design trends and important valuation and disclosure considerations. In addition, panelists will address how to appropriately manage share plan reserves, 10b5-1 issues, and post-vesting holding requirements. Diane Lerner, Managing Partner, Pay Governance Haroon Saed, Vice President, Compensation, Prudential Financial Inc. Moderator: Corinne Costa Davis, SVP, Human Resources, E*Trade Corporate Solutions to Register: http://www.equilar.com/events/compensation-committee-forum.html 23rd Annual NASPP Conference - Diane Lerner presenting October 27 - 30, 2015 San Diego, CA Key Steps to an Effective Compensation Committee This session addresses the complex issues compensation committees face to in exercising their fiduciary duties against a backdrop of increased shareholder activism, stringent proxy advisor policies, an active plaintiff’s bar and heightened media scrutiny. You’ll leave with the key steps to implement a successful committee process. (Levels II, III. CPE Field of study: Business Law) Alan Guarino, Korn/Ferry International Kenneth Laverriere, Shearman & Sterling LLP Diane Lerner, Pay Governance LLC Doreen Lilienfeld, Shearman & Sterling LLP http://www.naspp.com/conference/ Insurance Conference Group of Chief Human Resources Officers October 8th Insurance Industry Executive Compensation Group September 17th Prognosticators of Pay - Lane Ringlee presenting July 17, 2015 Don’t miss this unique opportunity to discuss the latest executive and director compensation challenges and trends with the peers who truly understand the complex issues you face—your fellow committee members and today’s leading compensation experts. Equilar Summit - Hollywood, FL - David Fitt, Steve Pakela & Brian Scheiring Presenting June 10-12, 2015 2015 Equilar Summit Prium, "Pay Energy." 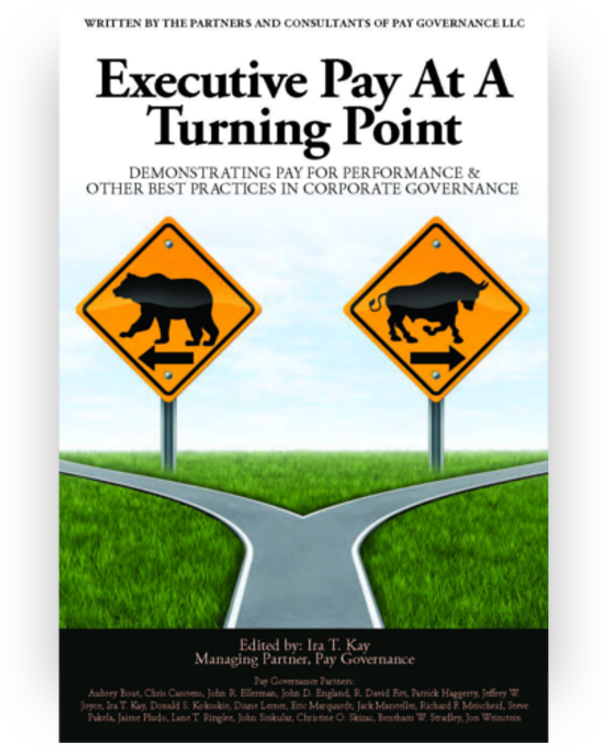 - John England and Jeff Joyce June 4, 2015 "Pay it Forward" Executive Compensation - Steve Pakela May 21, 2015 Pittsburgh Chapter of the Society of Corporate Secretaries and Governance Professionals WorldatWork 2015 Total Rewards Meeting - John England May 19, 2015 "Dare to Be Different: Resisting the Executive Compensation Norms." John England to Present CFO Board Academy, NYC, "Pay Energy." - John England and Jeff Joyce May 14, 2015 John England and Jeff Joyce to Present Conference on Income Inequality, Corporate Governance and Executive Compensation May 8, 2015 Cleary, Gottlieb, Steen & Hamilton, LLP with the Conference Board, will be hosting a conference on Income Inequality, focusing on Corporate Governance/Executive Compensation and what US Public Companies should understand about the data and the public debate. 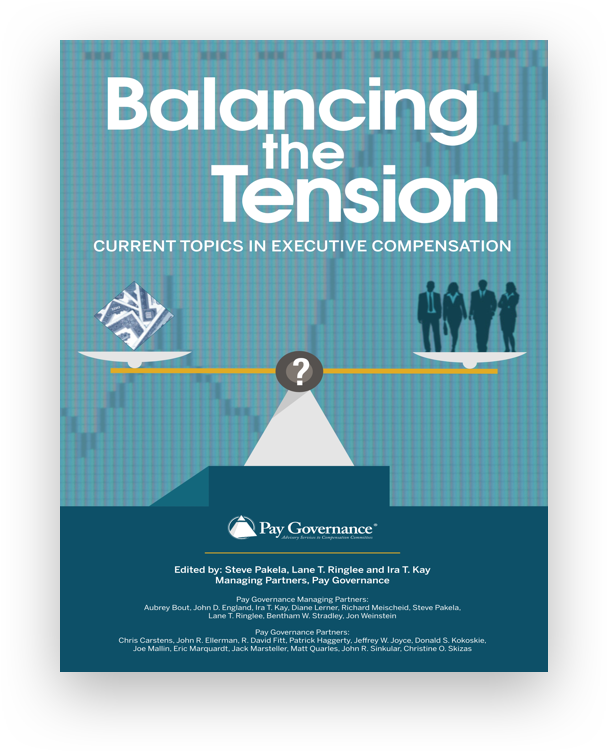 Ira Kay, Managing Partner of Pay Governance, along with David Chung of Equilar will conduct a panel discussion on compensation. Other speakers will include Steve Rattner, Ed Kleinbard, Alan Beller and a handful of others. The conference will be on the morning of May 8th, at Cleary’s Offices at One Liberty Plaza, New York, NY 10006. New England Region Life Science Compensation Roundtable May 6, 2015 With Biogen Idec, Pay Governance is happy to invite you to the 2015 New England Regional Life Sciences Compensation Roundtable. Human Resources Spring 2015 Meeting —The Biltmore Coral Gables, FL April 30, 2015 Ben Stradley to speak at NYSE "Investor Hot Buttons" March 31, 2015 Ben Stradley, Managing Partner, along with two other panelists, Jon Lukomik, Executive Director, Investor Responsibility Research Center Institute, and John Roe, Executive Director, ISS Corporate Solutions will be discussing the panel topic “Investor Hot Buttons". Ira Kay to Speak at Council of Institutional Investors 2015 Spring Meeting at the Mandarin Oriental March 30, 2015 Ira Kay to present at "Consultants Speak" Webcast March 10, 2015 2:00 pm Creating Focus, Alignment and Motivation Through Incentives that Can Deliver Value" January 27, 2015 7:30 am - 9:30 am Eric Marquardt and Chris Brindisi to provide and overview of research conducted by IRRci and discuss case studies. Learn how organizations can close the typical gap between creating value, performance management and Long-Term Incentive design.